So, many of you have asked about Blast, so it gives me great pleasure to announce that the best beat boxer in town and one of the founders of this beautiful movement is back. Don’t miss his ‘welcome back set’ this Saturday. WNS: The WNS fam has missed you, what can we expect from your welcome back set? BLAST: It feels good to be back. I believe that we all missed each other in the past few months. You can expect nothing new on my welcome back set but be sure to be blown away by beat-Boxing skills. It’s clearer, fresher and better than before. The return of BLAST (((Boom))). When and how did you get into beat boxing? I grew up listening to Hip-hop and I used to imitate this childhood friend of mine and a beat-boxer doing a couple of beats. I later mastered it and developed my own style. Since then I’ve never looked back. My level of beat- boxing improved dramatically over the years and through my style I fused hip-hop classics, jazz, rock, soul, poetry, house, kwaito, as well as some sound effects. What does it take to be a beat-boxer, can anyone do it? To be a great beat-boxer it requires a lot of practice, determination, patience and a lot of creativity but even so, anyone with lips, teeth and a tongue can become a beat-boxer. What has been your major highlight of working with Word N Sound? I remember the early days of WordnSound performing for six people inside a studio to an audience of more than four hundred people. Performing and sharing the same stage along side The Fridge, Lilly Million, Kabomo, Khethi, Lebo Mashile, Phillippa Yaa De Villies and many more. In Word n Sound I Trust. Is a storyteller of note. An amazing writer and frank talker who always seems to pack wisdom into even the simplest of utterances. “The State Of The Nation Address” will be his new offering on the Word N Sound stage.one day my poetry will become an art that everyone can have to keep. 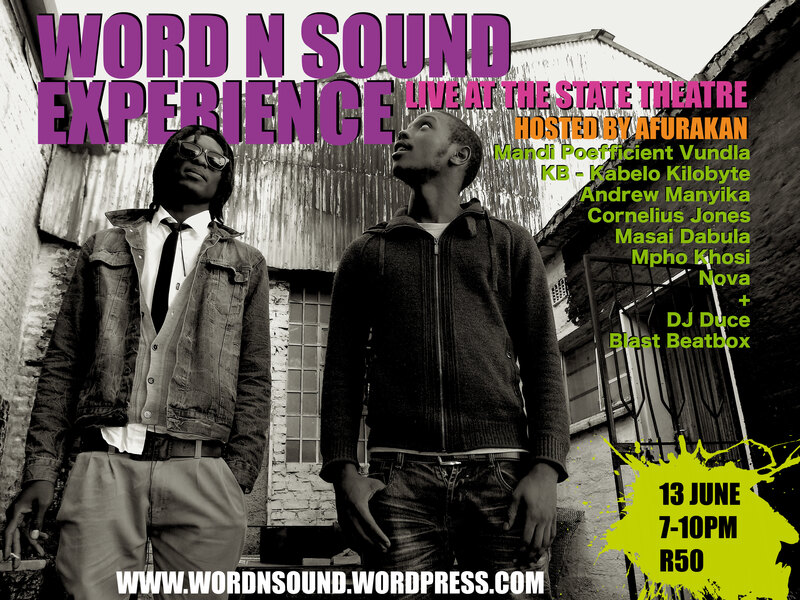 WORD N SOUND: You are calling your showcase ‘The State Of The Nation Address’. Why this title and what can we expect from it? What is the current state of local poetry? The current state of this art is filled with promises and wild cards. The eventuality that this art will one day become prominent in the art scene is only held back by misconception and tolerance to all types of presentation. Who is the hardest working poet today? The DOZ ladies are my choice right now, im seeing a different approach to female styles of writing. Who, from your contemporaries, inspires you the most and why? Tom Waits has been a revelation in the past few days, his voice needs a lot of tolerance but once you are over that the writing is emaculate, Khalil Gibran will always be amongst my favourite, he has the ability to draw you in and show you murals of yourself. Besides poetry, what else do you do? I am a self employed mutli-media creative director behind alexandra design house, visit my website www.alexandradesignhouse.co.za for more on that.